Ballot papers for elections to Labour’s National Executive Committee (NEC) and National Policy Forum (NPF) are being sent to Labour members from 26 July. It is important that all nine constituency party (CLP) seats on the NEC are secured by candidates that support the Corbyn leadership. The defeat of the left candidate for Vice Chair of the party (by one vote) at Labour’s May NEC meeting illustrates both how important this is and how close the balance is on Labour’s NEC. 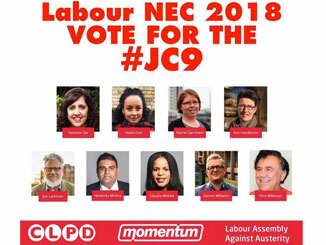 Visit Momentum’s website here to let them know you will be voting for the #JC9. Visit GrassrootsLabour.Net website here to download a leaflet. Details of the Centre Left Grassroots Alliance (CLGA) backed candidates standing for the NPF in each region can be found on Momentum’s website here. The ballot for the NEC and NPF closes at noon on Thursday 30 August.